Modify your ship into an armed ship, equipped with the fire series figurehead and increase the amount and power of your cannons as much as possible. Prepare enough cannonballs, and if you are rich in silver coins, it's suggested that you buy armor piercing balls. You can buy cannons and cannon balls from the shipyard boss, and you can produce them by yourself too. After you have cannons and cannon balls ready, you can sail off to looks for the corsairs and smugglers ships to attack. Keep in mind that smugglers prefer to operate at night. Left clicking the mouse to select a target and then press the attack button or click the target continuously to attack the enemy. 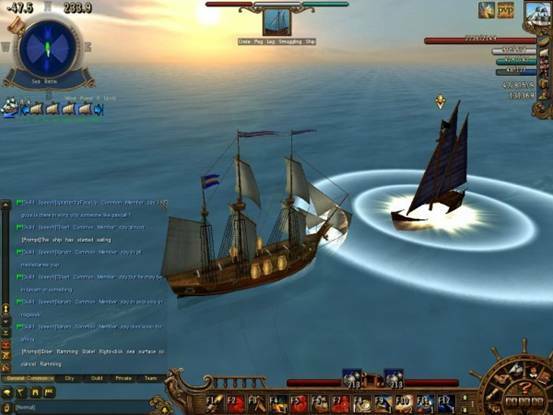 Players can fight with other armed ships. Ships have cannons on both port and starboard but keep in mind that your cannons are only effective with in a certain range . Your cannon's firing range in the mini-map is represented as a blue sector. Due to the cannon's firing range, you will have more advantage if you move your ship beyond the cannon firing degree of your enemy. It's called the 'T' type attack. Also players receive a skill point when they level up their sea battle skill to 4 levels. You can go to a port of call and use the skill point to learn the special sea battle skill from the skill master. Further more the higher your cannon combat level is the better cannons player may use . Cannons are divided into normal cannon, howitzer, buckshot cannon, quick-firer cannon, rapid fire cannon, dartling cannon. The attribute of normal cannon is average; the howitzer and the cannon has the longest firing range; buckshot cannon has a wide firing degree; the quick-firer and the dartling cannon has the highest firing speed. Your sea battle skill must be at least level 4 and you must have the proper grapple skill as well. Further more you must buy a grapple from the shipyard boss and equip it on your ship. Your land battle skills are more effecting during boarding when they are over level 11. Enter the battle field, and stay close to your enemy's ship. Then you can right click the grappling sign (in the sea operation part of the operation interface). When you successfully grapple your enemy's ship, it will switch to grappling battle. Grapples cool down is 20 seconds. You can use the same way to operate close fights as you do in the land battle. There are 3 kinds of strategy in the close fight for you to choose. 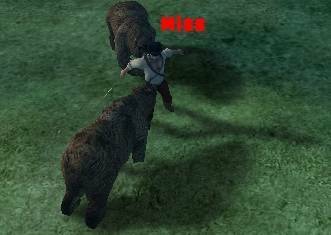 First, you can win by killing the captain of your enemy. Second, you can win by breaking the moral of your enemy. Third, cut off all the grappling and run away, which means you lose. You can use the medicine skill to heal your sailors. You can also run away by cutting off all the grappling when you are in inferior position. Since the trading ships lack the arsenal of a full warship, it can equip mines. The higher your ship's level is, the better the mines you can equip. Mines will do great damage to large numbers of enemy, but keep in mind mines also cause friendly fire. After you equip mines on your ship, the mine button will appear on your operation menu. Drag the sign into the shortcut column, and then you can use the shortcut key to release the mines. Your sea battle skill must be level 4 and the ramming skill is also needed. You must buy a ram from the shipyard boss and equip it on your ship. The others requirements are the same as the cannon fight. Ramming is another attack in sea battle. For the most part, you have to win a battle by cannon fight and grappling. In the sea battle, you can choose a target and click the ramming button. Then you can turn your ship to your enemy and attack them. Familiarize a weapon using skills and then upgrade it. Equip yourself with armor. And stock Healing Potions if you can. In the wilderness battle, the mouse would turn into the shape of your weapon or fist. Click to attack. Hold CTRL to lock target. Use Shortcut key for stunts. Each weapon in Land Battle has its own advantages and otherwise. A Sword is weak at attacking but comes with good hitting percentage. Falchion is average at attacking but good at defense. Axe is great at dealing damage but slow and not so good at defense. Guns boasts the best range, but its accuracy percentage is relatively low and its defense is also unsatisfactory. Healing is recommended, which would bring back your HP quick in battle. 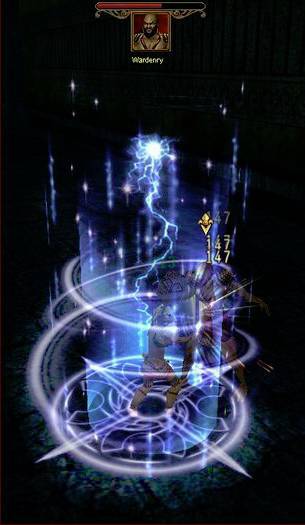 Each combat skill comes with Stunt, which would improve your fighting ability greatly. Team combat helps defense. Every target that a team killed brings 10% Exp to every member in the team.